Family Promise is hosting a murder mystery to raise funds for the shelter program. This is an event you won’t want to miss. No acting is required and there are no LINES to memorize. Guests simple interact with each other by asking questions and completing small objectives throughout the evening. Western costumes are not required but will certainly add to the theme and the fun. There are NO LINES to memorize. When all guests start interacting by following their 3 objectives: the murder will unfold. You’ll be collecting clues by talking to characters. At the end guests will try to guess the identity of the murderer. Various prizes will be awarded. RSVP’s are critical BY March 22nd so that characters can be assigned and extra information materials can be mailed/emailed including your character sheet. 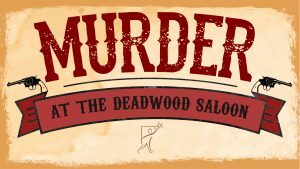 Typical characters include: saloon owner and wife, various saloon girls, sheriff,bartender,outlaws, prospectors, gamblers, etc. Party guests are encouraged to dress in simple western theme costumes for their character. Read Your Character Sheet– which you will receive by email in advance of the party. It contains your identity and all of the information you will need to play your part. Don’t reveal everything about your character- While there are many things that everyone needs to know about you, there are some things that should remain secret. Use your discretion. You may find out at the party that you are the killer. Dress the part– it adds to the fun. There will be prizes. Review the Deadwood newspaper, The Gazette for background information that may be useful the night of the party. This will be emailed or posted at a later date for party attendees. Use your money creatively– Upon arrival you will receive $500 paper money to spend any way you choose. Bribery and blackmail (highly encouraged) are two of the most common uses. Try to be the wealthiest player at the end of the night.